In order to give prospective buyers a clearer picture of what the MT6797 Helio 20 SoC has to offer, Mediatek has pit it up against Qualcomm’s Snapdragon 810 in a comprehensive stats comparison chart. As it turns out, the new MT chip has a lot to offer and has a few significant improvements over its predecessors. It is built using a 20nm manufacturing process, just like the Snapdragon 810, which allows for better overall performance to be achieved. The Helio 20 employs a Tri-Cluster setup with a total of 10-cores. This, of course, is all in pursuit of better resource management and improved power-efficiency. The aforementioned set of cores includes four Cortex A53 chips, clocked at 1.4GHz, another four, running at 2.0GHz and two Cortex A72 cores, which can be clocked between 2.3GHz and 2.5GHz. This means that the MT6797 Helio 20 will be employing the most powerful cores ARM currently has to offer over the Cortex A57 chips, found in the Snapdragon 810. This could, potentially provide major performance gains, but also poses a serious heat-management challenge, something the Snapdragon 810 is still battling with. But, there is a lot more to a chipset and its overall performance than pure computing speed. Memory plays a huge role and mediate was straight-forward enough in admitting that the MT6797 Helio 20 still relies on slower LPDDR3 modules, as opposed to the LPDDR4, employed by Qualcomm. We will just have to wait and see if this takes a big toll on performance. Graphics in the Helio 20 also look quite promising. The SoC comes with an ARM Mali T880MP4 700mHz GPU, which promises some serious pixel-pushing power. Sadly, though, the maximum screen resolution is still unchanged at 2560 x 1600 pixels, whereas the Snapdragon 810 can happily put out 3840 x 2160 pixels. Camera support on the MT6797 has received a lot of attention. the chip is capable of supporting up to 25MP. It also offers super slow motion video and Native 3D 2.0 for three-dimensional stills. Naturally, 4K support is present for both recording and playback, now, with the addition of HDR. 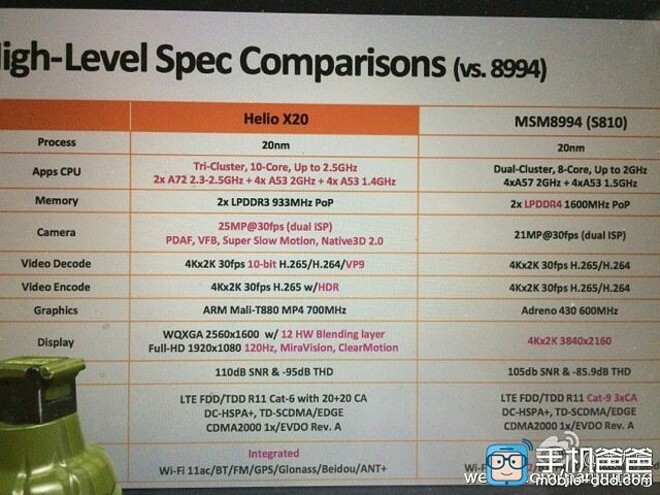 Overall, the MT6797 Helio 20 stacks up quite well against Qualcomm’s “top-dog”. It is wort noting, however, that Mediatek is still stuck with Cat-6 LTE, while the Snapdragon 810 has the significantly speedier Cat-9 at its disposal. This, however, might not be huge drawback for both smartphone manufacturers and end users, especially in less-developed markets, where LTE coverage is still spotty, at best. 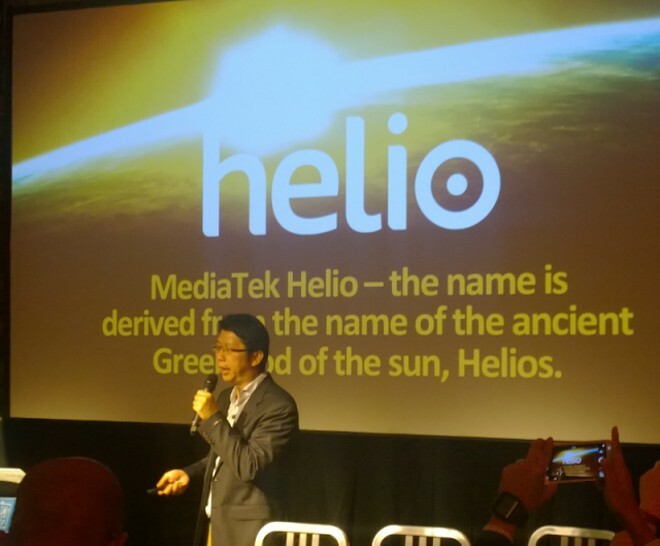 If Mediatek manages to set a competitive price mark for the Helio 20, the SoC has every chance to make it big both in China and abroad. As far as availability goes, the new MT6797 Helio 20 should start shipping to manufacturer in the summer and we can expect to see the first devices hit user markets by late autumn or early winter.